James Beard Award winner Michael Schwartz’s new Genuine Pizza™ is now open in Aventura Mall’s new expansion wing. 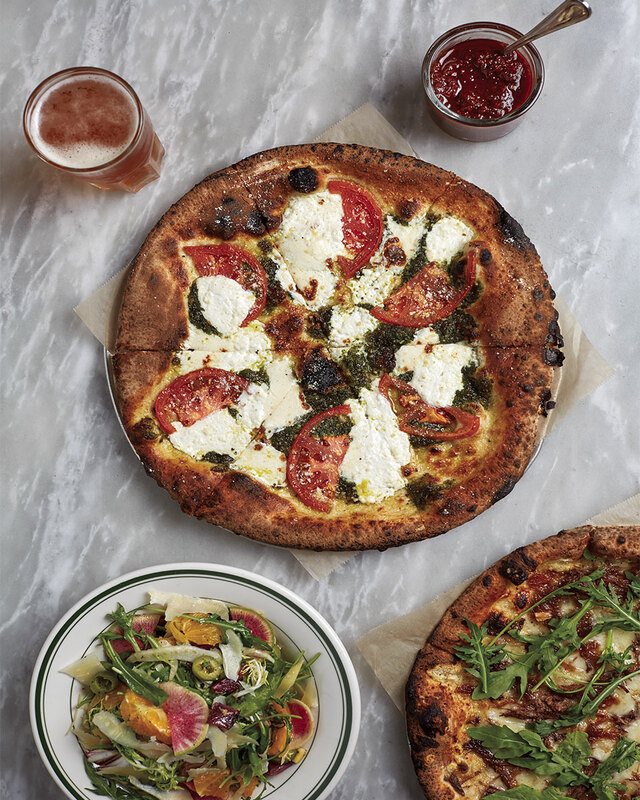 Formerly known as Harry’s Pizzeria, the casual restaurant features carefully-selected ingredients and creative flavor combinations with an innovative twist. The menu is jam-packed with plenty of pies with a quick-fire crust to choose from including Short Rib, Meatball, Bacon, Kale, Rock Shrimp and classics such as Cheese, Margherita and Mushroom. A gluten-free crust is also available as well as a daily pie and soup special. Plus, an assortment of salads, snacks and entrees are on the menu, making the meal ideal for sharing. Save room for dessert because the Warm Chocolate Chunk Cookie, the Zeppole with honey whipped ricotta and the Panna Cotta are at the top of the tasting list. Open just in time for holiday gatherings, Genuine Pizza is a welcoming place to bring family and friends. The restaurant showcases light woods with custom yellow and grey Cuban tile accents, orange chairs, and a yellow-tiled Marra Forni Rotator oven. With its rotating deck of pure cut Italian stone, the oven retains and conducts consistent heat to bake pies evenly and quickly. Plus, guests can watch the pizza making magic happen first-hand at a pizza bar situated in front of the open kitchen. For an extra slice of pizza perfection, check out the glass-faced dough room at the entrance where the original recipe is mixed and kneaded daily. Guests choosing to enjoy the outdoor view, can sit amongst garden planters and two distinct, dramatic works of art: Aventura Slide Tower – a 93-foot tall sculpture by German artist Carsten Höller that visitors will be able to slide down and Gorillas in the Mist – a whimsical fountain by The Haas Brothers comprised of three large-scale bronze gorillas and four massive bronze trees. Genuine Pizza is located on the first floor of the new expansion wing at Aventura Mall. It is open for lunch and dinner Sunday to Thursday 11:30 a.m. to 11 p.m., Friday and Saturday until 12 a.m. – no reservations necessary. Takeout with online ordering at genuinepizza.com is available. To reach the restaurant, call (786) 472-9170 or email aventura@genuinepizza.com.